Engaging potentials of sonic performance, this show investigates the materiality of acoustic vibration, and its relation to cross-sensory experience. Tones traveling through speakers transfer vibratory motion into strings, so that sonic frequencies are visibly excited in space. The taut strings, which have been physically attached to the speakers’ surface, sympathetically oscillate as the recorded composition plays back. 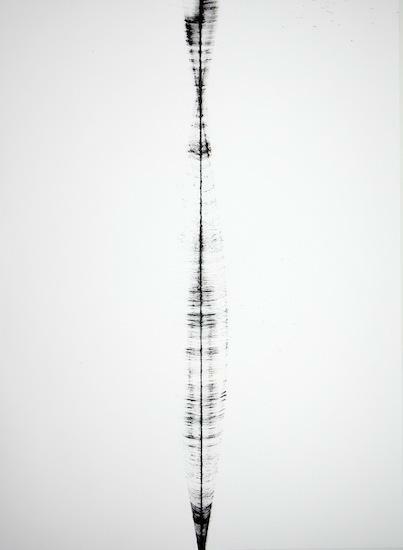 The result is a visibly interpreted sound - a sound drawn by string. In these works, the gallery audience is invited to experience both the durational immediacy of this phenomenon and its inscription in time. The installed string installation subtly trembles as layers of multi-channel audio engage the process over the duration of the exhibition. Meanwhile, the ink drawings are remnants derived from the same process in-studio. Ink soaked strings were precisely positioned above paper sheets and sent into vibration, resulting in a series of illustrated sonic moments - a sound reproduction as an act of mark-making. The audible tones in the piece were all sourced by recording the bowed sounds of a double bass performed by musician Sam Howard. Through electronic transformations, the resulting takes were rearranged into the recorded composition that makes up this installed work. In this way the gallery pieces reference their origins through a cyclic action. The sounds of strings are brought into speakers, and the motions of these sounds then return back into strings.